One of the problems with the written word is that word and phrase may have slight ambiguities in meaning that are clarified by context and be dictionary definitions. The’ metes and bounds’, i.e. the perimeter of the monopoly of a patent is defined by the claims. In the US, virtually every patent infringement proceeding includes a preliminary Marksman hearing where the parties argue as to how the claims should be construed. Once the scope of the patent is determined, the parties can argue about whether an allegedly infringing product or method actually infringes and appropriate damages. Israel Patent Application No. 181650 to Janssen Pharmaceutica titled “SOLID PHARMACEUTICAL COMPOSITION COMPRISING A PHARMACEUTICALLY ACCEPTABLE CARRIER AND HYDROCHLORIDE OF 4-[[4-[[4-(2-CYANOETHENYL)-2,6-DIMETHYLPHENYL]AMINO]-2-PYRIMIDINYL]AMINO]BENZONITRILE AND USE THEREOF IN THE MANUFACTURE OF A MEDICAMENT FOR TREATING OR PREVENTING HIV INFECTION” was allowed and published for opposition purposes. Teva Pharmaceuticals, Israel’s largest pharmaceutical company and the world’s largest generic drug manufacturer opposed the patent. Somewhat unusually for Israel patent office practice, following submission of claims and counter-claims, Teva noted a large discrepancy between the parties as to the scale of the monopoly covered, and requested a preliminary ruling on the scope of the claims. Teva argued that a preliminary ruling on the scope of the claims could expedite the opposition proceedings. The application was filed in Israel on 2 September 2005 and was allowed and published for opposition purposes in the August 2012 journal on 30 August 2012. The application for a preliminary ruling was submitted by Teva on 21 January 2014. Janssen filed their counter-claims on 20 February 2014 and Teva responded on 11 March 2014. 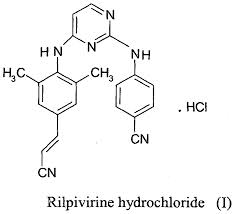 Both sides concur that the claimed invention relates to a solid medicinal preparation that includes a therapeutically effective amount of the hydrochloride salt of rilpivirine as an anti-viral agent by itself or with others. The argument between the parties is whether the preparation includes Amtrisitivan (FTC) and tanofoyer Diazonbrocsil fomrate (TDF). Teva claims that the claimed invention does not include the combination of rilpivirine, Amtrisitivan (FTC) and tanofoyer Diazonbrocsil fomrate (TDF), whereas Janssen rejects this interpretation and argues that the invention includes this combination. Teva alleges that a preliminary ruling on this issue would accelerate the opposition process and save judicial time. Specifically, should the patent office rule that the three-way combination is not included, they would retract their opposition, which by nature of the complexity fo the application is likely to be a protracted affair. On the other hand, if the correct claim interpretation is found to include the three-way combination, the opposition will be focused on other issues and will be less complex. (we assume that it is in the interest of the applicant for the Opposition to proceed quickly as a patent cannot be enforced until all oppositions are dropped or ruled on, and clearly the faster the process, the cheaper it is likely to be). The Opposition procedure is acknowledged by section 30 of the Israel Patent Law 1967. Grounds for Opposition are given in Section 31 and these include: (i) a reason why the Commissioner may reject the application; (ii) that the invention is not patentable under Section 4(2) (lacking novelty); and (iii) the oppose and not the applicant is the true owner of the patent. The Opposer considers the request for a preliminary ruling as a kind of division of the proceedings that will save time and could render further aspects superfluous and cites the opposition to Israel Patent Application 75934 Merkaz Argazim LTD. vs. Levy (1992) as a precedent for such a preliminary hearing. The Applicant considers the request as a delaying tactic designed to result in the Opposition including multiple proceedings. The Commissioner accepts that the opposition to Israel Patent Application 75934 Merkaz Argazim LTD. vs. Levy (1992) provides a precedent to splitting up an opposition, and that this is acceptable as long as doing so does not prejudice the rights of either party, but notes that the current case is not identical in that it is a preliminary hearing (that the Opposer claims could settle the issues. The commissioner ruled that he had the authority to make preliminary and intermediate rulings, but was not obliged to do so. From review of the claims and counter-claims he considered that there were differences that could best be clarified by allowing the presentation of evidence. The Commissioner considers that the issue behind Teva’s opposition was an allegation that the Applicants were claiming more than they were entitled to and that the so-called correct interpretation is a wide construction. In other words, Teva’s issue is Section 13a of the Patent Law and regulation 20. This interpretation (which opens the claimed invention to challenges on novelty and inventiveness grounds) is allegedly supported by the specification and how a person of the art would read the patent specification and claims. The Commissioner ruled that the Applicant should make an alleged interpretation for the Opposer to oppose, and without this it would be improper to rule on the scope of the claims based on so called internal evidence. Essentially Section 31 of the law is precisely to determine the scope of the claim protection and there was no justification to preempt this. The Commissioner referred to Hughes Aircraft and to Zuk Ohr vs. Car Security LTD and considered that in the opposition the Commissioner should rule on the scope of the claims taking the prior art into account, and that one cannot interpret an application without consider the inventive step therein, He then stated that the scope of the prior art before the Commissioner required gathering evidence and this was especially the case where there was an apparent dispute between the parties. The Commissioner considers that Teva wishes to clarify the scope of the claims based on internal evidence only, ignoring external evidence and expert witness testimony. Specifically the Commissioner noted that TEVA argued that claims 4, 5 and 10 of another Janssen patent, Israel Patent No. IL 173438 included the three-way combination of rilpivirine, Amtrisitivan (FTC) and tanofoyer Diazonbrocsil fomrate (TDF), and to allow the patent would result in two patents for the same combination. Without ruling on whether another patent of the same applicant is internal or external evidence, the Commissioner noted that there is a rebuttable presumption that the examiner was aware of the second patent. The commissioner considered that an Opposition required bringing something that the Examiner was unaware of, or a problem in the Examination, and does not consider that to be the case. In light of the above, the Commissioner considers that there are factual differences between the parties and the correct way to proceed is with a full-fledged opposition. Furthermore, the Commissioner argued that a preliminary ruling on the issue of patent scope might give one party an advantage in subsequent proceedings. He also expressed concern that this could open the flood gates to other preliminary ruling that could put a strain on the patent office. (this reminds me of a cartoon in MAD MAGAZINE where the wife wanted a washing machine to save on laundry bills, a car to save on bus fares and a coffee machine to save on restaurant bills, and the husband declared that he could not afford to economise). The Commissioner considered that preliminary hearings should be reserved for clear-cut cases where everything could be cleared up, and not for relatively complex issues. Finally, as an after-word, the Commissioner related to the so called Marksman hearings in the US, that TEVA suggested was a similar model. The Commissioner noted that Janssen did not see this US style preliminary ruling by the courts in infringement cases as parallel to the Opposition Proceeding before the Israel Patent Office. In conclusion, Commissioner Kling rejected the request for a preliminary ruling on the scope of the claims (ruling of 24 July 2014) and gave the Opposer until 30 October 2014 to submit their evidence. Costs for this interim ruling will be awarded together with costs for the main decision. Opposition to IL 181650 Teva vs. Janssen Pharmaceutica, preliminary ruling of 11 September 2014. I don’t think that the Commissioner needs to do more to reject a request for a preliminary ruling on one issue than to state that he does not feel it was the most efficient way to proceed. I can’t see one party appealing such a statement. Instead, the Commissioner has waffled over 5 1/2 pages. That is his right of course. However, I found this ruling poorly structured. What disturbs me more is that the Commissioner seems to consider that the scope of the claimed invention is somehow dependent on the prior art and on expert testimony. I disagree. I think the claims should be sufficiently clear without reference to prior art. The correct interpretation may depend on the specification and on dictionary definitions. It does not depend on prior art. The scope of what is actually patentable does depend on prior art of course. After clarifying what the prior art is, it may be justifiable to narrow the scope of the claims. I am familiar with various decisions that strike patents for claiming more than they are entitled to. I disagree with this approach. I think that it is justifiable to narrow the scope of the claims in light of prior art, and relying on dependent claims is one way to do this. I don’t consider double patenting per se. to be problematic. It may be the basis of a terminal disclaimer limiting the term of the second patent to the expiry date of the first patent, but there is nothing wrong with multiple protection of the same formulation with differently worded claims that protects different aspects. What is of relevance, of course, is whether Janssen’s earlier patent is novelty destroying prior art, or raises issues of obviousness. I do not agree that an Opposition proceeding needs to rely on a piece of art not before the Examiner. I think that it is sufficient for the Opposer to claim that the Examiner did not give sufficient weight to a piece of art or misinterpreted it to have the right to file an opposition, giving judicial review of the Examiner’s work. I note that in contradiction to the Commissioner’s approach (and, indeed, to Supreme Court precedent, Judge Binyamini of the Tel Aviv District Court who seems to be one of the better judges on IP issues, actually uses preliminary hearings to try to isolate the real bone of contention and to try to rule on this, making further hearings redundant. This does not imply that the Commissioner is wrong to prefer to have all evidence before him and to follow standard procedure. It is however interesting to note the difference in approaches. I also note that Janssen is represented by Gilat Bareket of the RCIP group which was where the Commissioner Asa Kling worked prior to becoming commissioner. As Reinhold Cohen is the largest local IP group this is not a surprising state of affairs and it is also true that the Commissioner has been in office for a reasonable period of time. I don’t know whether it is practicable for the Commissioner to excuse himself from all cases where RCIP represents one party or the other. Nevertheless I don’t think this looks good. It may be an additional reason for TEVA (represented by Shin Horowitz) to appeal the eventual ruling. Finally, I had a quick look at the claims of this application and consider them to be fairly clear. I don’t think that a Marksman type hearing would fairly address the issues that according to the preliminary ruling are those of concern to TEVA. I did not review the specification carefully, but did scan it, and could not find correct spellings in English for the chemical terms I’ve transliterated. Corrections and other comments, are, as always appreciated.